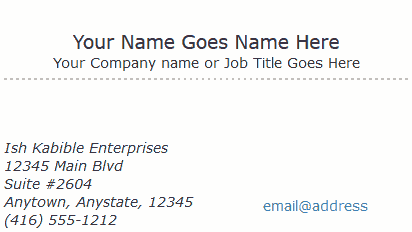 Creating your own free on-line Business Card Web Page is fast and easy with four simple steps. Once completed, your card will have its very own permanent URL that you can add to your email signature, give out to clients or post on websites and guestbooks! 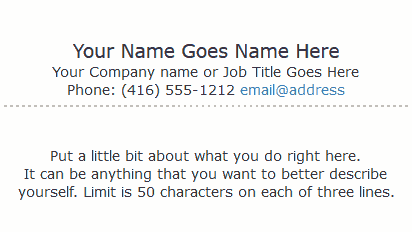 The usefulness of this on-line Business Card Web Page will prove its worth, time and time again! It's fun to create. Are you looking for our Website Page Creator? From the three samples below, choose the card you would like to create. Once you have decided, click the "Style #" link beneath it. Having chosen the style, the next page will ask you to fill in the necessary information. Some fields are mandatory to create the card, these are marked with a red asterisk (*). After you have filled in the information that you want on your on-line Virtual Business Card, press the preview button to see what your card will look like. If you are happy with the look of your card, press the "'Post" button beneath the preview to create your page. If you are not happy with the look of the card, press the back button on your browser either once or twice to repeat the above necessary steps. That's all there is to it. 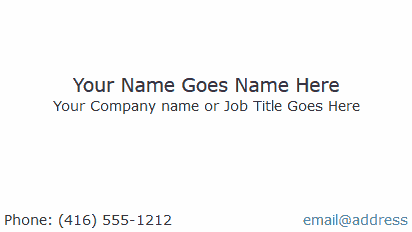 If at any time you want to have your online Virtual Business Card deleted, contact us with your Virtual Business Card URL and your e-mail address and we will remove it for you. Free advertising services. Business Card Web Page Hosting List. The PCman. The real cards will be full screen with your color choices. Select the card you want to create above each sample.